Last week, the JIBS master's student team formed by Kristina Baumgartner, Steven Lau and Rita Stefanuto, coached by Assistant Professor Massimo Baù, participated in the Family Enterprise Case Competition 2019 at the Grossman School of Business, University of Vermont, in Burlington, USA. JIBS Family Enterprise team from left: Steven Lau, Kristina Baumgartner, Rita Stefanuto, and their coach Massimo Baù. After a challenging training period, during which the Centre for Family Enterprise and Ownership (CeFEO) offered the team 6 extra-curricular lectures on family business topics and discussed 9 practice cases with the team, the students arrived at the University of Vermont in Burlington USA. There, they met 98 competitors from 25 different universities, who had all travelled from a total of 26 different countries. 52 judges also travelled from 12 different countries to judge the teams’ presentations. All in all, it was a truly global event. "On the first day of the competition, all teams were randomly assigned a division. In our division we had to compete against a Canadian, an American and a German team. 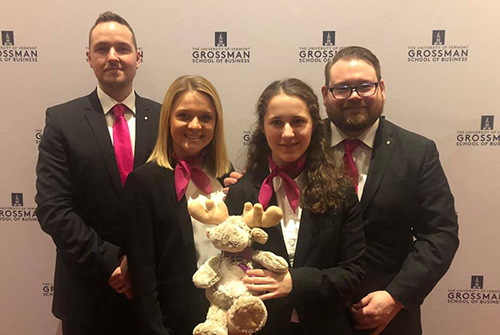 We had received the first case a few days before we departed for the competition, so we invested as much time as possible in developing an appropriate solution," explains Kristina Baumgartner. The intense training received during the months prior to the competition, as well as the high dedication of the team when solving the case, resulted in excellent feedback from the judges. In the next two days of the competition, the team had only 4 hours to get acquainted with a case and propose a recommendation on how the family enterprise should proceed. "The level of stress in the preparation room was extremely high, nonetheless, the training we received in Sweden allowed us to apply all our knowledge to the case and work well as a team," says Steven Lau. 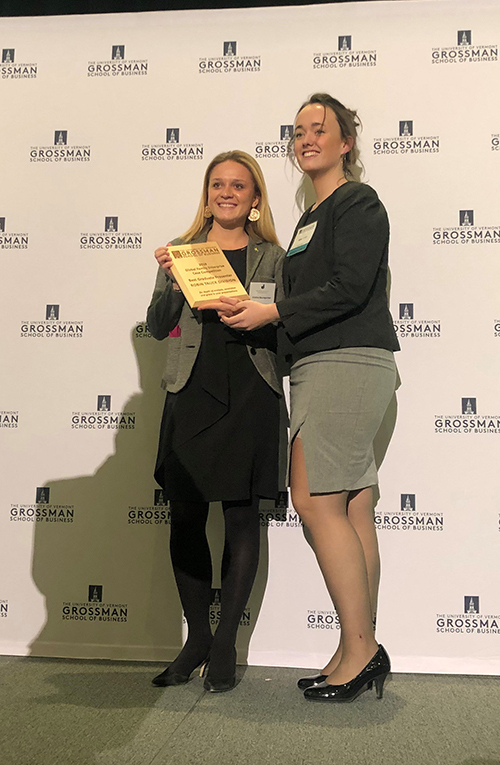 JIBS master's student, Kristina Baumgartner, left, receives the award for best graduate presenter at the Family Enterprise Case Competition. The team scored first place in all the cases, which meant they were the graduate team that made it to the final with the highest amount of points. Unfortunately, they did not win the final. However, Kristina Baumgartner was awarded best graduate presenter for depth of analysis, conviction and grace during the presentations. "We cannot deny that the last few months were very tough. We had to fit hours of training into an already very busy schedule and it was very stressful. But would we do it again? No doubt about it!" says Rita Stefanuto. "Now that we look back at our experience we realise how much we learned. We are now more confident in public speaking, we challenged ourselves to be critical thinkers and collaborate with team members even when opinions were divergent. We also learned the importance of empathy when advising family firms. Furthermore, during the competition, we could network with hundreds of ambitious students and judges from all around the world. It was a unique opportunity to meet interesting people and build friendships."